FRANKLIN, Mass. – When the showdown between rivals Mansfield and Franklin was moved from Tuesday to Thursday because of rain, it meant to two things: the winner of the game would now clinch at least a share of the Kelley-Rex title and Franklin’s starting pitcher would be different. Franklin ace Jake Noviello toed the rubber on Wednesday against Attleboro, meaning that the Panthers would go with their number two starter. But luckily for the Panthers, their number two is also an ace. Junior Jason Ulrickson (6-0) scattered five hits in 5.2 innings of work to earn the win and also delivered at the plate, going 2-for-4 with three RBI and a run scored, leading the Panthers to a 6-3 win over the Hornets under the lights on the campus of Franklin High School. The win clinches at least a share of the Kelley-Rex title for Franklin, the program’s first league title since 2012. “We have all the respect in the world for Mansfield, coach Breen and that team,” said Franklin head coach Zach Brown, who earned his first title in his fourth year at the helm. “We knew it would be a dog fight. They made it really tough on us. Franklin didn’t waste too much time to get its offense in gear, plating a pair of runs in the bottom of the first. Jake Lyons reached on an error to lead off, Ryan Hodgkins singled to move Lyons to third and Ulrickson lined singled up the right side to bring the first run in. After a fielder’s choice, Tyler Gomes grounded a single through the hole to bring Ulrickson home. Mansfield was quick to respond, cutting the deficit in half in the next half inning. Cullin Anastasia singled and moved to second on a fielder’s choice. Kevin Dow took ball four, which turned into a passed ball, allowing Anastasia to take third. Anthony DeGirolamo hit a grounder that looked to be the third out, but the ball was dropped at first and Anastasia scored. The Hornets then took the lead in the fourth inning, tacking on two more unearned runs against Ulrickson. Kyle Moran got things started with a two-out single and Dow followed up with another single to put runners on the corners — Connor Driscoll taking third as a pinch runner. DeGirolamo drove a shot to right field that required a tough play from the fielder and the ball fell out of the glove, allowing two runs to cross on the error. “We just didn’t make the pitch when we needed to, we didn’t make the play when we needed to,” said Mansfield head coach Joe Breen. The Hornets had three errors. “It was somewhat of an uncharacteristic game for us. Unfortunately when you play a team like Franklin, you don’t get to make that many mistakes and come out on top. Franklin came back to regain the lead in the bottom of the fifth inning. Senior Josh Macchi led off with a single and Gomes launched a double to put runners on second and third. Sophomore Alex Haba delivered the big hit of the game, doubling to left center to bring in two runs to give Franklin a 4-3 lead. The Panthers’ offense kept rolling an inning later, plating two more insurance runs in the sixth. Lyons notched his second hit of the game to start the inning and took third on a perfectly hit and run play with Hodgkins knocking a single into right. Ulrickson padded the lead with a two-run double into right center to put Franklin up 6-3. Franklin junior Bryan Woelfel recorded the save, pitching 1.1 scoreless innings. Franklin baseball improves to 12-3 overall in league play. The Panthers can win the title outright with either a win over King Philip on Monday or an Oliver Ames win over Mansfield on Tuesday. “It feels great, but we’re not done yet,” Ulrickson beamed. Franklin baseball (13-4) is back in action on Friday with a trip to Framingham. Mansfield (13-5 overall, 11-4 Hockomock) hosts Oliver Ames on Tuesday. FRANKLIN, Mass. 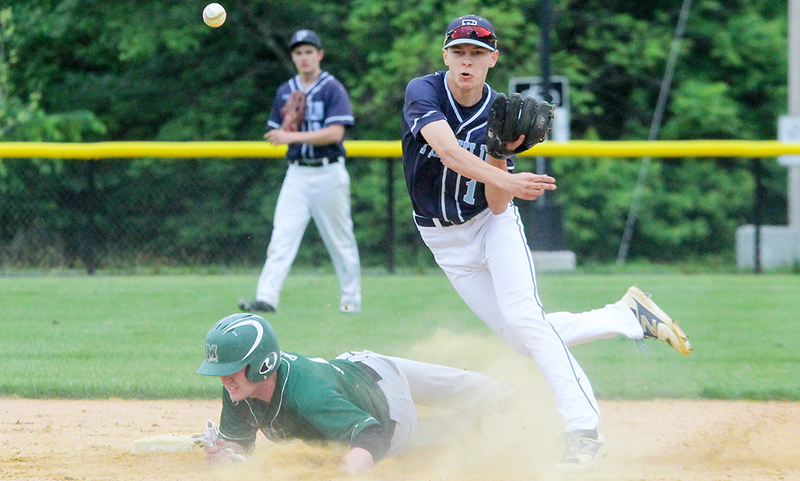 The Franklin High boys baseball team used a late two-out rally to force extra innings and eventually walked off with a 4-3 win over previously unbeaten Walpole. Trailing 3-0 heading into the final at-bats, the Panthers were down to their last out. Senior Jake Lyons came through with a single into left, and Ryan Hodgkins followed that up with a single of his own. Tyler Gomes drew a walk, and with the bases loaded and two outs, Josh Macchi singled up the middle to score both Lyons and Hodgkins. With runners at the corners, Bryan Woelfel singled home Gomes to tie the game up at 3-3. After a passed ball, Franklin had runners at second and third, but Walpole managed to get a strikeout to send the game to extra innings. Woelfel came in to pitch in relief in the eighth and induced a 1-6-3 double play after inheriting a runner at first. Woelfel then struck out Sean McCarthy, but a dropped third strike allowed him to reach base safely. Given new life, Brett Lavanchy singled which advanced McCarthy to third, but Tyler Page grounded to Macchi who took it to first himself for the out. In the bottom of the eighth, Franklin had a runner reach second but was picked off. Woelfel struck out McCelaney to start the top of the ninth, but Andrew Moore singled, and after Cam Martin grounded out Charlie Auditore singled to advance Moore to third. With runners on the corners and two outs, Woelfel struck out Bryan Kraus to end the inning. Lyons singled to kick off the bottom of the ninth. Tyler Gomes drew a one-out walk, setting up Macchi with runners on first and second. Macchi delivered, singling up the middle to score Lyons and give Franklin the 4-3 win. “Josh has been a contributor for us for the last couple of years and is a mainstay in the middle of our lineup, so whenever he’s up we feel really good about our chances,” Brown added about Macchi’s 2-5, three RBI performance. Walpole got on the board first in the bottom of the second when Lavanchy drew a walk and then Tyler Page hit a comebacker right up the middle that hit Franklin pitcher Jake Noviello in the knee and allowed him to reach with a single. Noviello would manage to stay in the game, much to the benefit of the Panthers. After Page’s hit, an error by Franklin allowed Lavanchy to score from second, but Noviello would get Andrew Moore to ground out to short to end the inning. In the top of the third, the Rebels threatened again after Cam Martin doubled, but Franklin third baseman James Leofanti made a magnificent leaping grab on a line drive by Charlie Auditore that would’ve driven in Martin. Kraus got hit by a pitch to put runners on first and second, but Noviello worked out of it, striking out Brian Gaughan and getting Sean McCarthy to line out to first. Cam Schlitter completely shut down the Franklin bats early on, as he struck out five batters his first time through the order, only surrendering two hits. 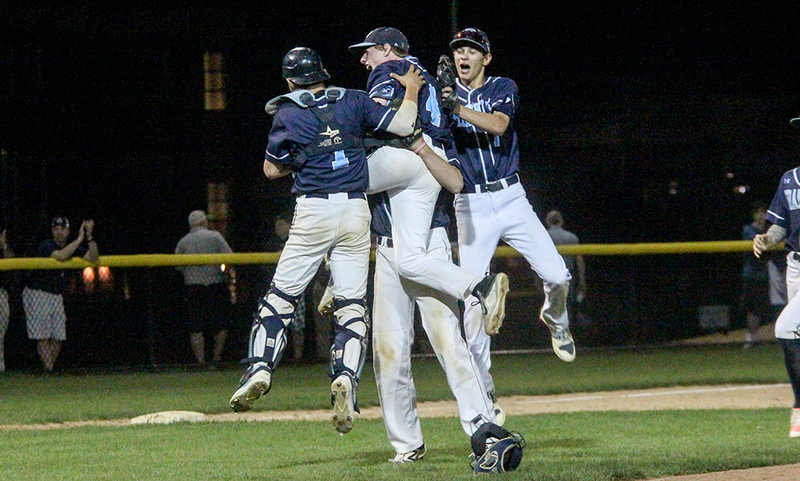 In the bottom of the fourth, Franklin threatened when with two outs, Alex Haba walked and then stole second, but in the process he took a shot to the face, and the collision forced both Haba and Walpole shortstop Jack Magane out of the game. A single by Noviello put runners at the corners, but Schlitter picked up his sixth strikeout to escape the jam. The pitchers duel only continued from there, with Noviello only allowing one baserunner from the fourth through the sixth, while striking out three guys en route to seven total strikeouts in 6.1 innings pitched. Schlitter would exit in the bottom of the fifth after walking Leofanti and Hodgkins to put runners on first and second, but Walpole’s Matt Danato would get a fly out to left field to end the inning. In the sixth, Danato would allow a two out single to Noviello, who finished the day 2-4 in addition to his stellar performance on the hill, but that would be all. Tyler Page would lead off the seventh with a single, and then Teddy McCelaney, the injury replacement for Jack Magane, drew a walk. Andrew Moore then laid down a perfect sacrifice bunt to advance Dylan Hannafin, who pinch ran for Page, and McCelaney. With runners on second and third, Cam Martin laced a single into right field to score both Hannafin and McCelaney and put Walpole up 3-0. Leofanti came in to relieve Noviello, and he immediately picked off Martin and then got Charlie Auditore to fly out to right. Franklin (3-2) gets back to action Thursday afternoon at 3:45 in Mansfield to take on the 3-2 Hornets.